There are a number of different roofing materials available these days, some of which are more appropriate for particular environments and roof styles. Choose something that works well in your area, on your house, and with your project style. 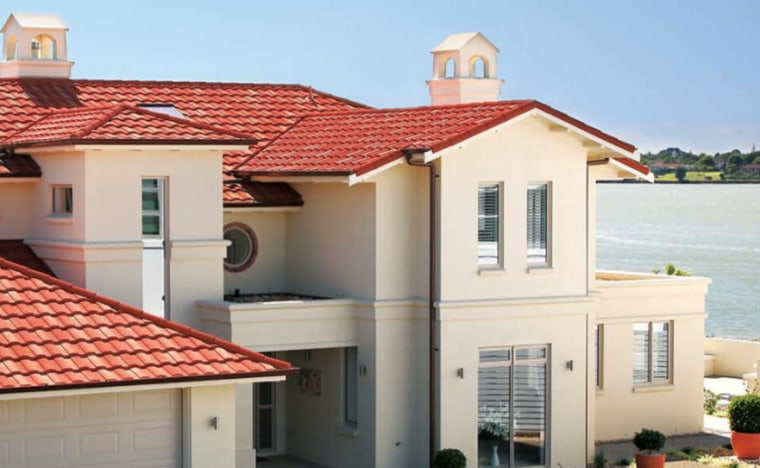 Concrete tiles can have a long life-span but this is dependent on a high level of maintenance. They can become porous over time and can also be prone to cracking if they’re not walked on correctly. Concrete tiles are also highly susceptible to movement during earthquakes, so if you live in an earthquake prone zone, then you’ll probably want to consider another option. If you have water seeping through your concrete tiles this is a sign that you should consider getting a new roof. Metal tiles are easy and quick to install and come in an extensive choice of profiles, styles and colours. They also have an extremely long lifespan of 50+ years and require very little maintenance - simply apply an approved roof wash to keep your roof clean of dirt and organic growth. Metal tile profiles and roofing accessories are engineered to interlock and overlap to resist wind lifting and keep out the harsh elements. They have also proven to be one of the safest roofs in earthquakes, hurricanes, fires and hail storms. Longrun or corrugated iron roofing has been around for centuries. It is a popular choice but it does have limitations – it is prone to rusting particulary in coastal and geothermal locations, and as longrun is installed in long sheets this makes small repairs difficult (in comparison to smaller tiles). If you have a longrun roof on your home and it is showing signs of rust or lifting sheets then you should think about getting a new roof. Traditionally, roofing shingles were made of stone or wood, but more recently, composite asphalt shingles have been introduced to the market. The performance of asphalt shingles varies depending on the manufacturer and the amount of fibreglass reinforced layers. In most environments, they have a shorter lifespan than other roofing materials and are prone to delamination and lifting in high winds. If your current roof has loose or missing shingles then it could be time for a re-roof. Decramastic tiles are scallop-shaped galvanised metal tiles coated with bitumen and stone chip - these are the older generation of metal tiles that you may have heard of. Although they were a good product for their day, they had mixed reviews due to being easily dented and losing stone very quickly due to the breakdown of the bitumen coating. They were developed with older technology and were far less durable and architecturally designed than today’s modern pressed metal tile roofing. Modern metal tiles such as Metrolite use ZINCALUME as a base with an acrylic coat over laid with a natural stone chip with a second coat of acrylic over-glaze – extremely durable which is emphasised by their 50 year warranty. Membrane roof can be used on flat or nearly flat roofs. Membrane roofs are most commonly made from synthetic rubber, thermoplastic (PVC or similar material), or modified bitumen. Depending on their installation they can be susceptible to water pooling in the absence of water channels.